This is a mostly empty domain owned by Colin Murphy (talking about the Albuquerque-Austin-Chicago Colin Murphy, not the evil soap opera doctor or the Irish comedian). This store does not sell miraculous insecticide chalk, so please don't ask. Mainly it just sits here, raking in enormous amounts of passive income from random keyword matches and wayfaring strangers wandering into its lair. Oh look there. You see? It's an advertisement. There's another one over there to the right. Down below are some things I typed to make sure this thing worked the way I thought it did, which it generally seems to. Please, if you have any suggestions on how to make this a more interesting and user-centered passive income raking experience, let me know by one of the mediums above. The CTA released the Ashland BRT Environmental Assessment yesterday. 1) 13 out of 89 intersections would operate at "unacceptable" Level of Service (E or F) vs. 6 in no-build scenario. But proposed mitigation (signal times, changes to roadway geometry etc.) at all 13 intersections bring LOS to acceptable levels or even improve it. However, some of the proposed mitigation measures would involve widening the roadway or other changes inconsistent w DOT's Complete Streets guidelines, which will have to be worked out. 2) Some parallel roads, esp. Western and Racine/Southport, will see more congestion, but travel speeds (off Ashland) shouldn't be impacted more than 1-3%. The grid should be able to deal with diverted traffic such that no neighborhood streets will be hit especially hard, but mitigation of impacts will be addressed block by block as needed. 3) 88-89% of parking on Ashland is retained, which is still much more than the amount of parking actually used even at peak demand (55-74%, usually much less), so no mitigation is proposed. 4) Bus travel time and reliability are vastly improved--83% avg speed increase (to 15.9 mph), 9.4 min time savings on typical 2.5 mi trip, 50% better on-time performance. Expect 29% more riders and 26% transit mode split along Ashland. There's lots more in the report, but those are the easily summarized points so I don't forget them. SOLD ! 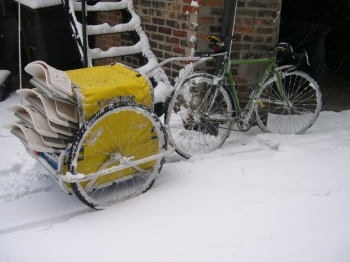 For sale is my very well treated Cycletote trailer for attaching to your bicycle, including the bare cargo trailer, child-trailer conversion, and dog-carrier conversion. Since first my dog and then my child loudly objected to riding in it, it has been used almost exclusively for cargo--and then only a few times a year when unusual volumes needed transporting. 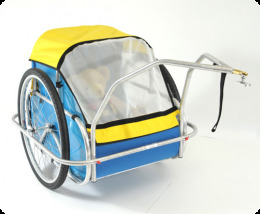 If you've seen them, this is along the lines of a Burley Cub or Encore (bigger than the Bee) or Chariot but with the ability to convert into a dog trailer (like a DoggyRide) or utility trailer (like a Bikes At Work). 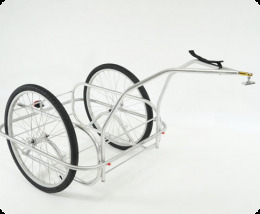 This is a very adaptable bike trailer made by a small American builder from high quality materials, and has seen only light use; I'm looking for $450 for everything, but will entertain any reasonable offer. All told, that gets you: one Cycletote bare utility trailer, with 700c Sun CR18 quick-release wheels (36 hole) and Kenda 700x38c clincher tires, seatpost attachment and 27.2mm seatpost clamp; like-new child carrier setup, including aluminum canopy hoops to attach to base frame, fabric, seats, floor, and rain/bug shield; somewhat road-grimed but generally intact pet-carrier setup, including fabric, floor, canopy; never-used mudguard for trailer tongue. The base frame and dog part of the bike trailer were purchased in 2003, used with some regularity until 2005, and at that point were semi-retired because my living/bike storage situations made it a total hassle to use very often. Then with a new child, some garage space, and dreams of trailerful summers, I bought the child-carrier conversion last May; it was used only long enough to definitively establish that my kid would rather never go outside again than continue riding in it. (This speaks to my son's character, not the trailer's.) So I believe the universe is telling me bike trailers are not for me. 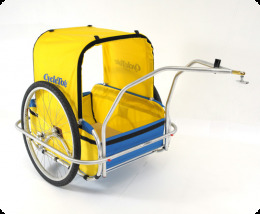 There aren't a lot of these kind of bike trailers around, so here are the basics: it's a TIG-welded lightweight aluminum frame, manufactured in Ft. Collins, CO, with heavy duty fabric optionally stretched over the frame (top and bottom) for protecting cargo that needs protecting; welded dropouts fit standard-width front hubs for both 26" and 700c bicycle wheels. Everything is modular and very thoughtfully designed, so if in a few years you want to swap the 700c for MTB wheels, or want their self-actuated braking system for handling the brutal downhill of some new railroad overpass, or need a stroller conversion, it will fit. You can even call on the phone and talk to the talented but somewhat cranky individuals who manufactured it. The hitch is a ball joint to a seatpost clamp, although they make various other attachment systems for differently shaped bikes and recumbents and whatnot. It attaches and detaches quickly, leaving only a small and light metal bracket pointing out behind your seatpost. Please email me at colin at josecrappus dawt calm with any questions (note: I LOVE participating in schemes involving foreign money transfers for much greater than the amount paid, so definitely email me all of those offers right away!). See Cycletote's site (http://cycletote.com) for more info and an example of some of the worst web design of the modern era. Below are marketing blurb and specs taken from their website; very little except prices has changed since I purchased. Some of the photos are of the actual trailer, some are from cycletote, I'll let you guess which ones are mine. - Outer dimensions with wheels removed (LxWxH): 34" x 32" x 14"
- Length with tow bar: 58.5"
- 5-point harness for child/children are fully adjustable. Center seating for one child or side-by-side for two with shoulder strap adjustment that continues to fit perfectly as children grow. - Outer dimensions with wheels removed (LxWxH): 34" x 32" x 27"
- Mesh and vinyl front covers. - Outer dimensions with wheels removed (LxWxH): 34" x 32" x 29.5"
I used to enjoy the Tothian writing of letters to the producers of products I admire, like the makers of A1 Steak Sauce. A few days ago, a postcard fell out of an old vinyl LP of the Tijuana Brass I was about to consign to Goodwill pile, suggesting a new project. From now on, any old business reply postcard I find, I will document their filling out and mailing in and whatever comes of this. Here's the first one, to High Fidelity Magazine, at One Sound Drive, Canton Ohio. Since sending it I looked it up and found that it ceased publication more than 20 years ago, but hopefully somebody there in Canton will have some back issues they'll throw my way. We, the style authority of this site, duly selected and installed, hereby decree that the title style is not even sentence case. I don't even know what you would call it. Only proper nouns, and then only a few of those, chosen pretty much at random, will be capitalized. Middle-of-sentence case? Definitely no way will there ever be all caps anywhere here as long as I can dictate what's what. 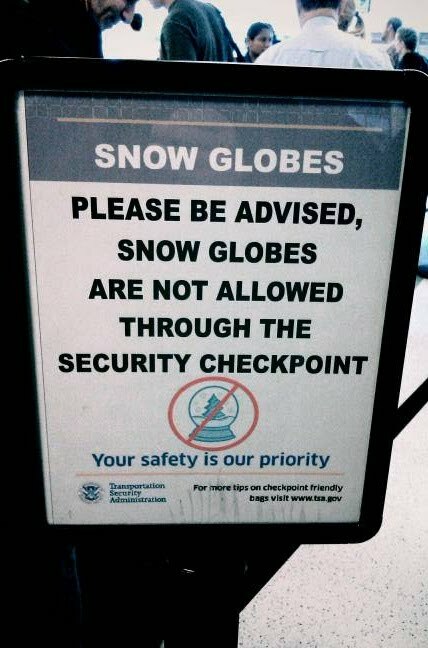 Snow globes were enough of an issue at this LGA security checkpoint that they had to make an entire laminated sign about it.